Singer/songwriter COUSIN ALICE creates a completely unique sound - gritty, sweet, and heartfelt, delivered with a shot or two of humour. Likened by one listener as "a cross between Tom Waits, Peggy Lee and Marianne Faithfull", Alice seduces audiences with her smokey voice, antique banjo-ukelele and battered array of musicians (the cream of London’s blues and jazzers), performing a collection of jazz standards, pop, nostalgia, original songs and the blues. 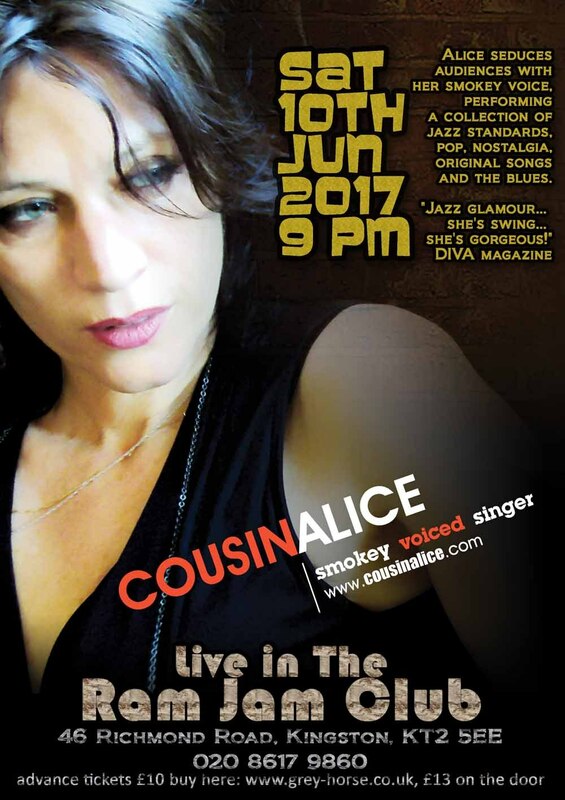 Holding the crowd in the palm of her hand, be it a large music venue or intimate cabaret club, Cousin Alice is a magnetic performer. Raised in New Zealand, of Barbadian/Welsh/English parentage, Alice is based in London. She has been enthusiastically received in New Zealand, the Caribbean and Europe. Her residencies include the famous Café de Paris and Boisdale’s of Belgravia. She’s swung through many a ballroom, banquet and bar, to name a few - The Savoy, Hampton Court Palace, The Groucho Club, Berkeley Square Ball, The Times/BFI London International Film Festival, Holder’s Season in Barbados and has appeared at an eclectic mix of London nightclubs - the sequined underworld of the Voluptè Lounge, 1920’s themed Black Cotton Club, Soho’s Black Gardenia and Stranger Than Paradise. Over the summer of 2009 Cousin Alice was in Rio De Janeiro where she established exciting projects with local producers and DJs, resulting in remixes/arrangements of her compositions. Inspired by these collaborations and the vibrant city there will be more to come.